That means “delicious” in Lao, and that’s exactly how I feel about last weekend. A dear friend came to visit (long-time readers may remember him from this post), and it was the perfect way to re-acquaint myself with home after my month on the road and the whirlwind that is the beginning of the semester. D. arrived on Friday, after a long bus ride. 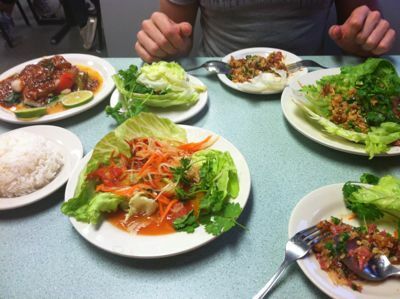 I took him straight to a Lao feast, complete (though you can’t see it here) with Beer Lao I picked up from our local beverage store. Tam mak heung, nem khiaow, khao niaow, and a red curry fish dish with a Lao name I can’t remember. Saep lai. 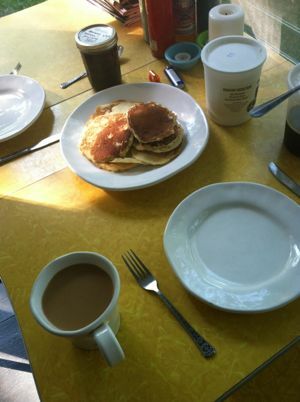 On Saturday morning I made pancakes and we ate them on the porch! 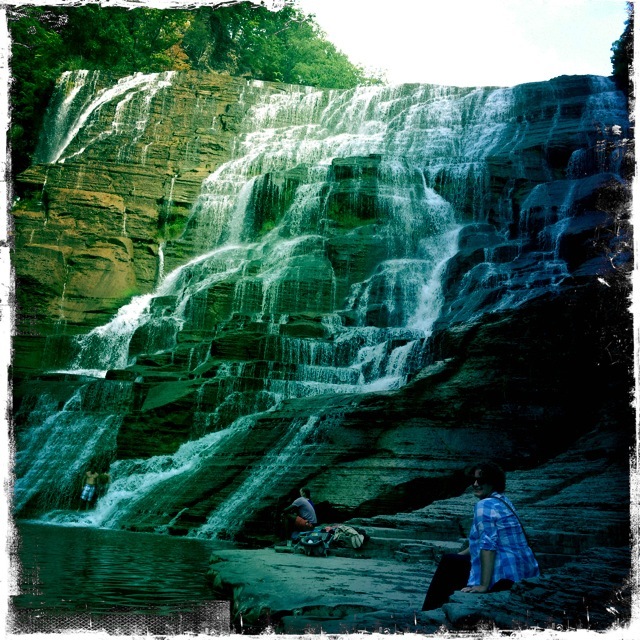 And then we went to the farmers’ market and on a short walk to these waterfalls (seen here in D.’s hipster-view). 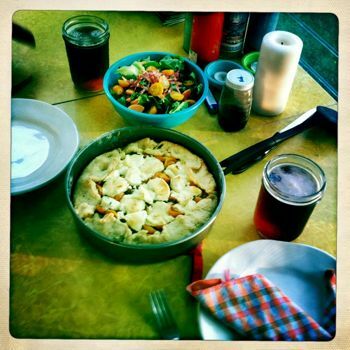 On Saturday night, I made a tomato tart with goat cheese and about a quart of farm cherry tomatoes. (This is the one with the dijon mustard slathered on the inside of the crust.) That salad is all farm veggies, too: red peppers, grated beets, carrots, cherry tomatoes, and lettuce. 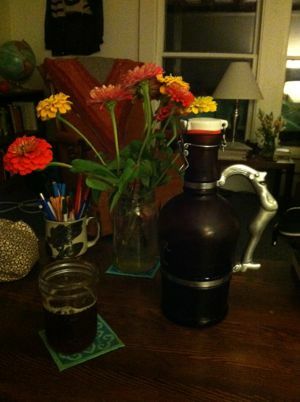 D. brought a growler of a delicious amber brew from his home. On Sunday morning, we drove to a neighboring lake to go out for a fabulous brunch on the deck. 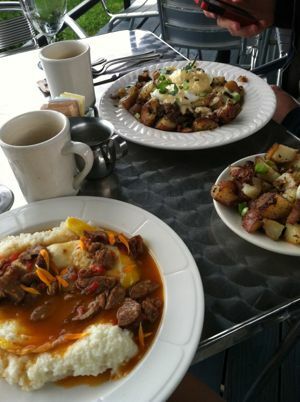 Cheesy grits in homemade sausage gravy, corn beef hash with poached eggs in a dijon hollandaise, rosemary potatoes…so good. Then we visited a distillery and tasted brandies, bourbons, gin, and rye. I was too busy enjoying myself to remember to take any pictures there. And then it was time for D. to catch his bus home. It was a full (and tasty) weekend! I enjoyed another glass of beer from the growler D. brought, and prepped Monday morning’s class. 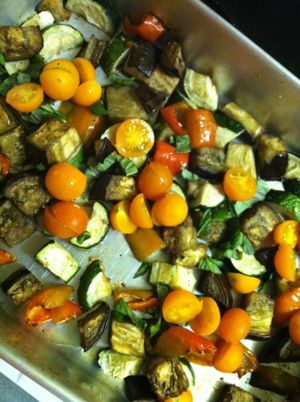 I also ate these roasted vegetables. The eggplant was particularly delicious, and a nice way to conclude a fantastic weekend. I also started another pinwheel blanket (also a wedding present). Pictures of that soon! This entry was posted in kitchen, life, out of doors and tagged brunch, lao food, pancakes, roasted vegetables, tomato tart, visitor, waterfalls by barefootrooster. Bookmark the permalink. Is that a deschutes growler? Once again, I want to eat all of this! It looks like you had a fantastic — and delicious — weekend. Yay! Yum, and what an amazing weekend! I love that tomato tart recipe, too.